We'll start with the overnight breaking news which comes from the Radio Catalunya sports show El club de la mitjanit who report significant movement in the possible transfer of Cesc Fabregas to Barcelona. They say on Friday Cesc's agent will be in Barcelona to discuss a strategy to allow the transfer between the two clubs to take place. Significantly, they say Arsene Wenger will not stand in Cesc's way if he want to leave the club and that the Spanish champions will have to pay less than they bid last year because there is one less year on the Arsenal captain's contract. According to the radio show, Cesc has told Arsenal he will only move away to Barcelona and will not entertain a move to Real Madrid or Manchester City. There is further coverage on Sport.es via Google translation. For me there are a few discrepancies with reality over this story. I would find it very hard to believe that Arsene Wenger gave Cesc assurances that he won't stand in his way if Barcelona as expected come calling this summer. Especially if it meant that Arsenal would be receiving less money than they were offered for his signature last summer. The Frenchman has always honoured his contracts and expects others to do the same. So why would this be any different this time round with Cesc? As for the cash offered, when you consider Liverpool have put together a £20million deal for Jordan Henderson to join them from Sunderland, offering less than £28million for Cesc and Arsenal accepting it would be madness. If the first thing Stan Kroenke does as majority Arsenal shareholder is agree to the sale of our captain for less than his market value, I'm sure there will be a huge backlash against the club. 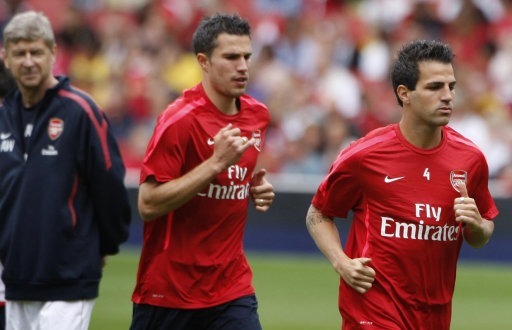 Every Arsenal fan knows how important Cesc is to this team. Even if you think he didn't have the best of seasons and his heart was not in it, you'd expect the club to demand the fee fitting a world class midfielder who has won both the World Cup and European Championship whilst representing Arsenal more than 300 times. Less than £50million and Arsenal will be seriously underselling our captain. There is obviously a step up in the movement of this deal, so don't be surprised if a official bid is made sometime within the next seven days. "I just want tell you dont listen the newspaper and the rumours i will let you know if something happen." Nasri said himself in an interview with French TV - where he failed to distance himself with a move to Manchester United - that he'll make his mind up on his Arsenal future after France's game tomorrow with Poland. I wouldn't expect him to tweet anything about staying, but his failure to commit to the club whilst not ruling out a move to Arsenal's biggest rivals has upset a lot of fans. One such fan who tweeted Nasri about his future got both barrels from the Frenchman. What is not a rumour is that Nasri is holding out for £110,000 a week. He knows he can get it elsewhere, so it's up to Arsenal if they are prepared to pay him what he thinks he's worth. And let's not get too hung up on the figure he wants because lets face it, when Rooney and Tevez are on £200,000 a week, the market is there for these exorbitant wages. Yes, I agree that Nasri is yet to prove himself consistent over his previous three seasons at the club. But if he can take the performances he produced in the first half of last season and replicated them over a whole campaign, he would be worth that money. As I said the other day, no one player is bigger than Arsenal and if we feel we are unable to meet his demands we will be forced into selling him. I'd much rather see him say but I think there is only a small possibility of that. Theo Walcott has been talking about us keeping hold of our best players and that would have to include both Fabregas and Nasri. "I can understand why some players might want to leave because they just want to win things. That’s totally what it comes down to. "I can’t speak for them, but being the players they are and playing in matches such as the World Cup final, they believe in Arsenal as well, but we need to be winning things. You want to build on your best players and Samir Nasri is definitely one of our best players. We’ll be disappointed if he goes, but it’s totally up to him, it’s his decision. Only time will tell. "I don’t know whether Cesc will stay or go. You want to be there and play with him, and he will attract new players as well. But he wants to win things. it’s difficult and there are mixed emotions. "We don’t want to be losing our best players and suddenly coming out of the top four. It just can’t happen otherwise you start losing the younger generation coming through." It seems to me that Theo is expecting a summer of change at the club. And he's right, we need to be in a position at the start of the new season where we have a set of players who will be able to fight for the league and Champions League. If we are to lose both Cesc and Nasri, we'll need to replace them with quality signings that will inspire confidence not only in the supporters but in the other players. Fans expect the players to play for the shirt and give their all for our club, but there has to be a prospect of winning a trophy to push them on as well. The desire to win motivates sportsmen no matter their sport. Putting in place a team which can compete for the highest honours will ensure that all of our players will be highly motivated but if we fail to replace any member of our squad adequately, there will be problems ahead. Next season will be one of the toughest Arsene Wenger has faced in attempting to retain Arsenal's position in the top four. We should not rely on developing players to make that top four finish. We need proven winners to come into this squad and push us on to achieve our goals. There are a few transfer stories doing the rounds. The Sun say Arsenal and Manchester City have been quoted a fee of £17million for the signature of Bolton's Gary Cahill. Shakhtar Donetsk are willing to sell us midfielder Willian if we're prepared to sell them Denilson and give then £4million cash as well, according to The Sun. Sebastian Larsson won't be rejoining Arsenal according to the Daily Mirror who say he's now likely to go to Sunderland as Jordan Henderson's replacement. And finally, it appears that Jens Lehmann won't be hanging up his gloves just yet as Schalke are interested in signing the 41-year-old as a replacement for Manuel Neuer according to the Daily Mirror. Good luck to him if that deal does come off.